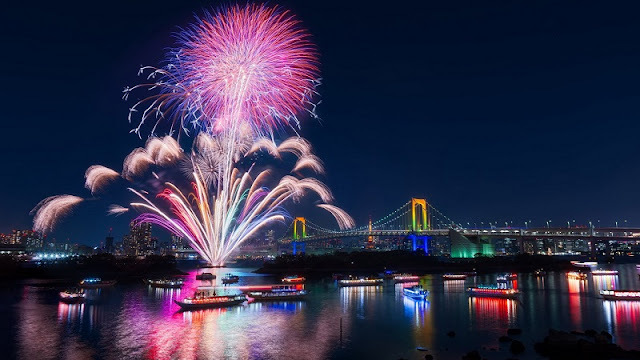 The 2019 Da Nang International Firework Festival (DIFF), themed ‘Stories by the Rivers’, will take place from June 1 to July 6, featuring the participation of eight countries. The information was released at a press conference by Da Nang city People’s Committee and Sun Group on March 19. The festival will consist of five competition nights with respective themes of ‘The root’, ‘Living sprout’, ‘Love’, ‘Colours’, and ‘Setting sail’. The opening ceremony will be held on June 1, featuring the competition between Vietnam and Russia. The following nights will feature the competitions between Brazil and Belgium (on June 8), Finland and Italy (June 15) and England and China (June 22). Two most outstanding teams will enter the final on the evening of July 6. Within the framework of the festival, a wide variety of attractive activities will be held, including a flash mob dance competition and a street carnival. The stage comes replete with a host of new technologies to create an even more dynamic and dazzling show. In the front of seating areas, there will be large LED screens so that audiences can watch art performances more closely. In addition, the shows will incorporate modern visual effects and advanced techniques. First launched as the Danang International Fireworks Contest in 2011, the annual event was upgraded to a full-blown festival in 2017, under the sponsorship of Sun Group — the leading developer of high-end hotels/resorts and entertainment complexes in Vietnam.